Like many of our customers, we ride our bikes almost daily. We log in over 10,000 miles per year on average. Over the years, we’ve had some close calls and in some instances, accidents involving motor vehicles. With cycling becoming more popular and more riders taking to the road for fitness, commuting, or just casual riding, it is inevitable that riders will find themselves in hazardous situations when riding in and around car traffic. As cyclist, we can help our own safety by adhering to traffic laws and working on our situational awareness. With the inherent danger of motorist texting or talking on the phone while driving, it is imperative that we pay attention to our proximity to cars, debris, and road obstructions. The burden of our safety does not solely rest on our shoulders, motorist too have to become more aware of cyclists on the road as well. 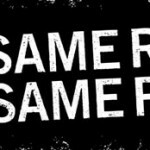 There is a great article that is relevant to road safety for both cyclist, motorcyclists and motorist alike; What an RAF pilot can teach us about being safe on the road. 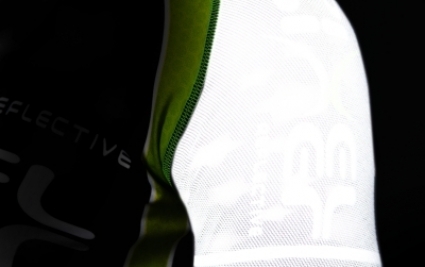 With the popularity of HiViz (High Visibility) clothing for cyclists, D Dub Custom Sportswear will begin working on a range of HiViz clothing. Many HiViz jersey, vests, and jackets tend to be pretty bland in appearance. 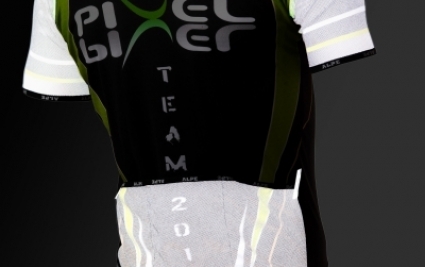 We will introduce a series of jerseys that we call the Illuminare Series (150gsm and 295gsm with fleece); jerseys that combine HiViz color, unique design styling, and constructed with new Pixel fabric technology. The material is unique in that it has fine reflective glass beads that are chemically bonded to the material yet do not interfere with the fabric’s wicking-properties. 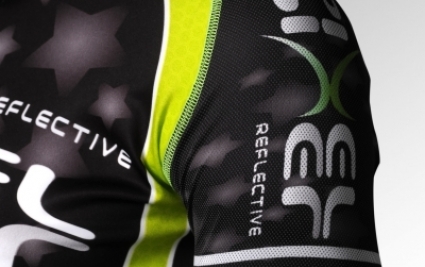 The material can then be sublimated like any other jersey in our product line. This means that you can literally have a HiViz Yellow jersey by day that becomes a white reflective jersey at night. The jersey becomes a dual-purpose safety garment. We want to help our customers increase their visibility on the road. We will use other reflective fabrics and apply them to the D-Illuminotor Series product line to include new HiViz shorts, shoe covers, knee warmers etc. The new garments will be available in our online store and available for our Custom and Semi-Custom options in Early 2015.